Whistler and Blackcomb Mountains and the surrounding area is home to hundreds of black bears. They can be found deep in the forests or on the grassy ski runs during the summer. During the early spring (mid-May to mid-June) when the grass is lush, green, and tender, you will be able to observe resident black bears along the side of the highway and on the ski trails. You may be lucky to see residents mothers with cubs and/or yearlings. This is the time of the year when breeding starts. The bears continue to graze on the different grasses during the later part of spring (mid-June to mid-July). The clover is in season and as the snow melts and recedes on the slopes, the bears follow the grass up the slopes. This is when you will have the best chance of seeing the adult bears’ courtship and mating activities. During the early part of summer (mid-July to mid-August), the bears begin to disperse as the food sources change and the mating season ends. They bears continue to feed on grasses and also forage for the ants which are found in rotting stumps and logs of old fallen down trees. The berries, such as salmon berries, black berries, thimble berries, blueberries, and others are beginning to become more plentiful and become a bigger source of food for the black bears of Whistler at this time of the year. The late part of summer (mid-August to mid-October) is when the bears are a little higher up in elevations looking for berry fields. As the berries season ends the bears will go back to grazing grasses and clover at lower elevations. 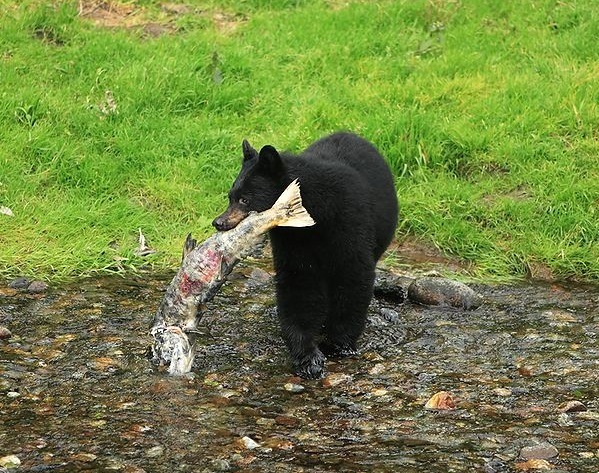 Fall (mid-October to end of November) is when the salmon return to the local rivers to spawn and the bears will be found along the banks of the rivers eating as much salmon as they can before they head back to their dens for the winter. This is the last chance to see bears until they emerge in the early spring again. Book your bear viewing adventure with Alpine North Limousines Today!